Artist Manss Aval’s new collection of oil paintings offer a vibrant reinterpretation of the world around us, creating abstracts with a level of high emotional connectivity. The artist lives and works in San Diego and his work has been exhibited in shows all around the world from California to New York, to Paris, Rome, and Tokyo to name a few. 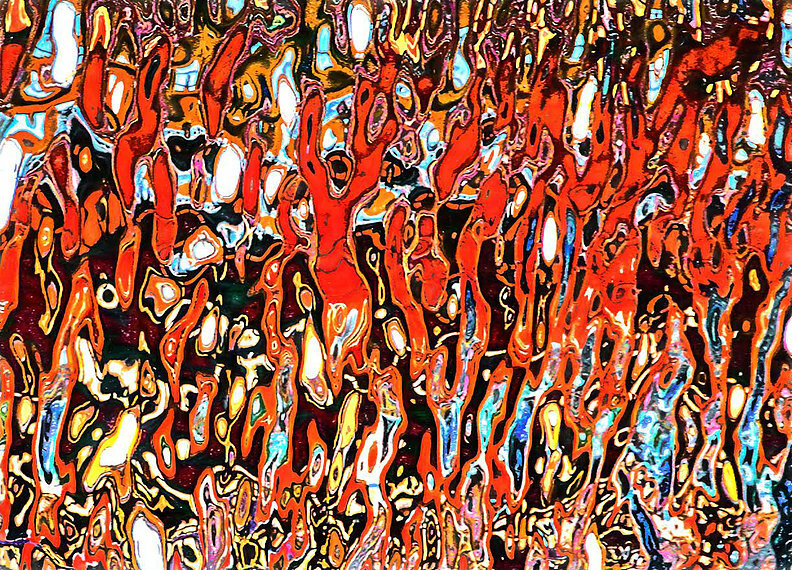 His newer paintings are a group of brilliantly colored abstracts. 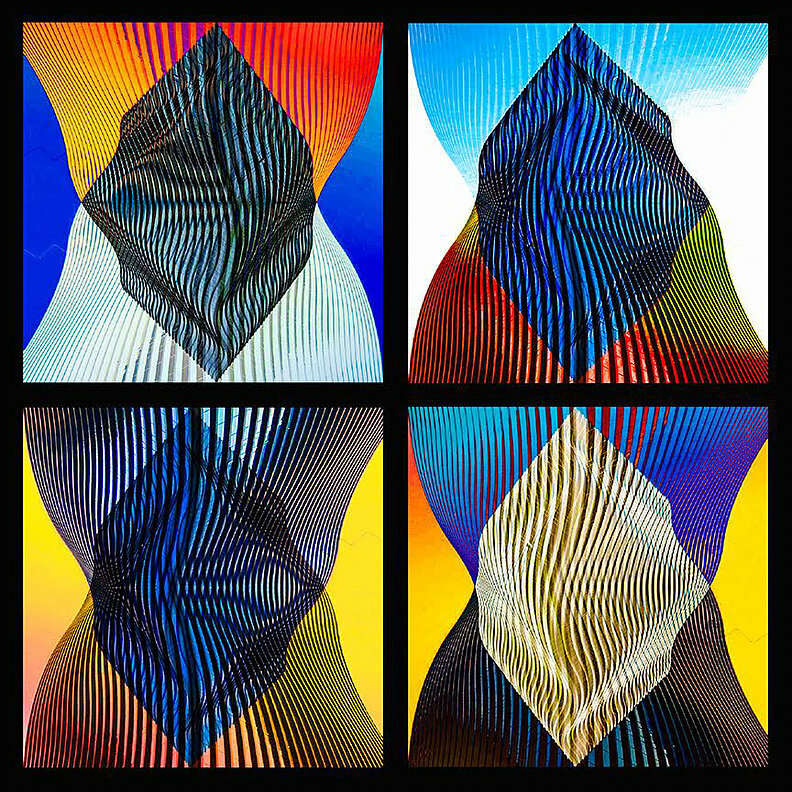 Manss Aval describes the works stating, “My more recent series is dealing with geometric building blocks to create ‘interactive’ pieces that engage and invite the viewer to give free reign to their fantasies and memories.” The series draws on the patterns of symmetry and geometry found in nature building complexity from deceptively simple elements. Aval’s work is also influenced by the tradition of geometric designs and and calligraphy from his homeland Iran. The series of paintings transforms inanimate objects into dynamic compositions from which faces, designs, and figures emerge. Many of the paintings work through the use of repetition and alteration. This is evident in both the “Pesce Rossi” Quadriptych and the “Pesce Rossi” Diptych. Both works repeat a form of undulating lines on 40 x 40 panels of canvas. The form is similar on all the panels; an almost symmetrical shape that that fluctuates based on varying angles of curves and different sections of overlapping lines. The changes from panel to panel are noticeable but the longer one stares at the painting, the more evident it becomes that each panel is a unique work of art that is both connected to and completely different from the other panels. Each of the squares shift colors throughout their forms, but the color shifts from panel to panel are not completely uniform in the way of an Andy Warhol print. Instead there is more of a freedom within the colors applied to each section in order to explore different visual possibilities. The paintings tease the eye back and forth from examining a single panel up close to examining each of the paintings as an entire unit. Although some paintings work through the variation of a related design, other works are less geometric and more closely related to figurative work. The oil painting “Dante’s Visit” presents stunning hues of red and gold dancing across the canvas recalling flickering flames and roiling figures anguishing in hellfire. The color palette is full of rich jeweled tones appropriate for a church, making the viewer recall images of stained glass, decorated leather-bound bibles, and cavernous stone spaces that seem fitting for the medieval tale that the painting’s title references. “Dante’s Visit” recalls an ominous space of a medieval church and eternal punishment while also maintaining a more personal and emotional feeling that a modern viewer can relate to through the expressive and lyrical forms on the canvas. The entire collection works in the way of placing the viewer into the realm of the strange while also grounding itself through elements that are familiar and connectable. The paintings feel like imaginative adaptations of a world that is already known. This interplay draws one in closer for a more intimate examination trying to uncover the recognizable elements of the paintings while also exploring the elements of the strange within them.